September 27th I had the pleasure of attending the grand opening of Baldinini’s first US flagship at the Short Hills mall in Short Hills, New Jersey. The Italian accessory and shoe brand has been styling the people of Italy for over 100 years. The brand created by Gimmi Baldinini’s grandfather began in San Mauro Pascoli in the region of Emilia-Romania Italy in 1910. The family continues to grow the shoe brand that produces only 140,000 shoes a year. Allowing for their customers to own a limited amount of unique and custom shoes and accessories. The sleek and minimalistic store is a clean pallet for the intricately designed shoes and attire that stand out to the customer. The brands house colors of chocolate and cream are carried throughout the boutique showcasing the colorful shoes and fur coats. The store carries men’s and women’s shoes, outerwear and travel accessories. Currently on display in the store is the women’s Gimme Baldinini fall/winter capsule collection. The bags of this collection include patchwork while the shoes have spiral constructed heels. 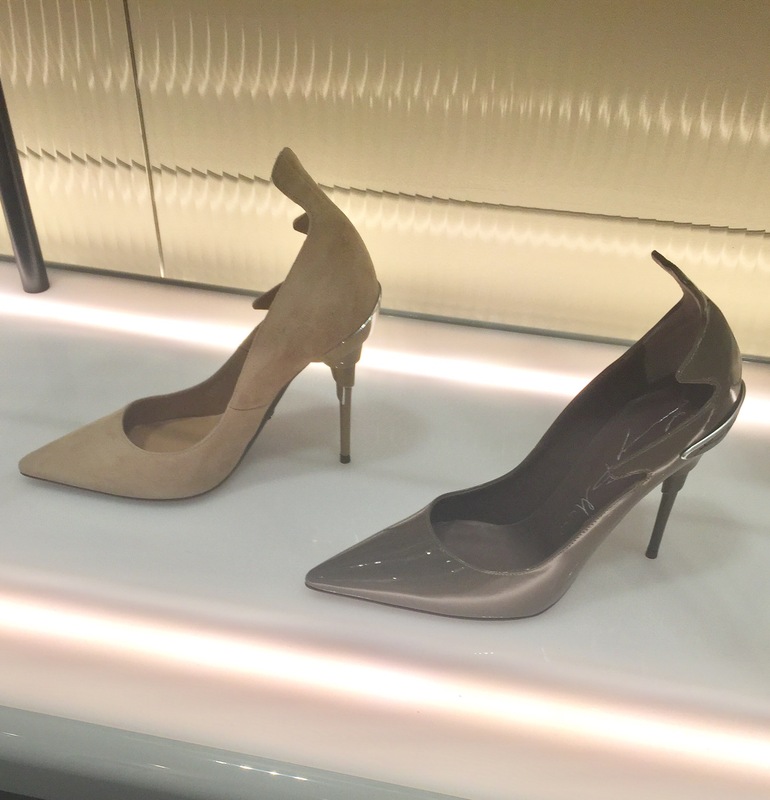 The collection features shoes and handbags ranging from $606-$1,668. The handmade shoes and purses include items made from leather, suede, calf hair, fox, mink and satin. Their woman’s collection consist of enamled heels, metal accents, black lacquered leather soles and metal plates. Online currently their heels are 50% off running from $168-$313. Their current men’s rock collection is inspired by England and it’s musical rock history. Scuba and rubber bottoms make what looks like a heavy boot extremely lightweight. All shoes are made in Italy except their espadrilles which are made in Spain as they always should be. As European sizes always run small their women’s shoes sizes run from 5- 11 1/2 while mens run from 6- 13 1/2. 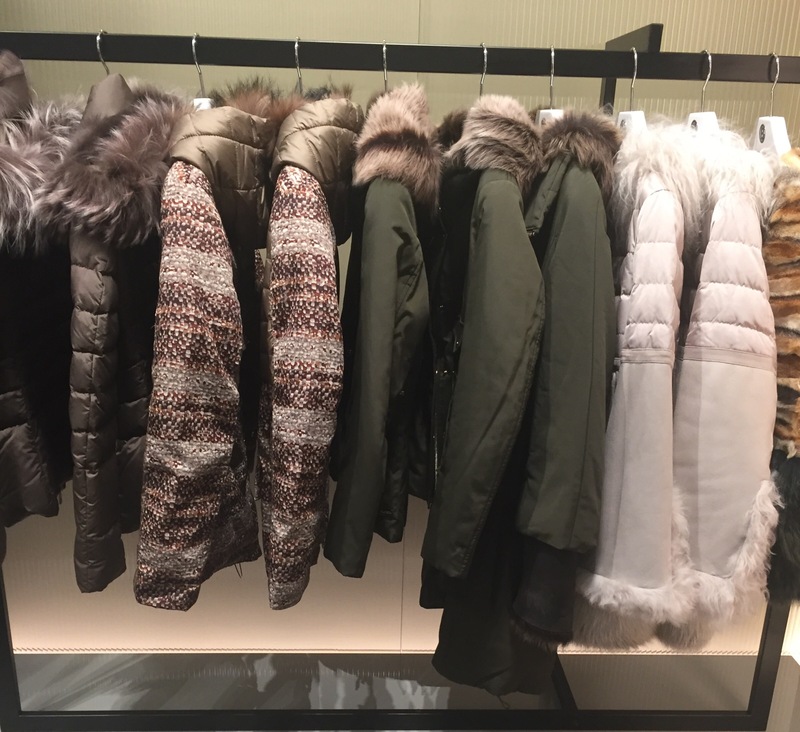 Outerwear includes coats, jackets and parkas ranging from $977-$2,347. Fabrics used to make the outerwear consist of down, nylon, leather and wool, as well as sheepskin, gabardine, lamb, high tech wicking fabrics with removable hoods. The combination of mixed fabrics allows for flexibility and warmth while wearing them. Women’s sizes run from 00-14 while mens runs from 32-46. Baldinini men’s and women’s watches are Swiss made of steel and leather. The watches that range from $432-$1145 have accents of crystals and gems and water proof abilities.Their unisex travel pieces include lightweight monogramed polycarbonate trolley luggage. Travel bags include calfskin weave prints, neoprene and durable netting. The backpacks, briefcases and shoulder bags of leather and saffiano calfskin all rang from $241-$932. The brands house fragrance of which I fell in love with comes in candle and diffuser forms ranging from $56-$101. The scent’s comforting notes of bergamont, mint and rosemary filled the boutique. The Baldinini headquarters in San Mauro Pascoli is where the company does all administrative, product design and manufacturing. All steps needed in making and selling their products are done in their headquarters. Raw materials are made into models and product design and test control are proceeded through Baldinini. They also hold display and commercial areas for buyers who come from around the world. Their showroom in Milan in the square of via Bigli 4 showcases two floors of products for buyers. All creation and production is done by Baldinini ensuring that their vision and quality is to their standards. The brand that has been featured in Vogue Italia has 120 stand alone stores in Paris, Moscow, Beijing, Hong Kong and the Middle East. Furthermore the brand has more than 100 flagship stores around the world. Baldinini which does 5% of its business in the US is growing throughout the rest of the 2016 year and continuing in 2017 by opening more stores in New York City and Miami. Baldinini is continuing a tradition of handmade shoes, outerwear and accessories that can only be seen in a family run company. The 250 craftsman and workers within the company ensure that the Baldinini name is preserved with exquisite materials high quality craftsmanship and selective production. I hope I was able to teach you a bit about this great Italian company. Let me know in the comments section or on social media if you have been able to visit the store and what you think. Although I was invited to the opening all opinions are mine as well as pictures except the press pics which were given to me for my blog use by the company.